Before closing Broadway got her branded a car-hating communist, DOT commissioner Janette Sadik-Khan was already well on her way to transforming the city’s streets. 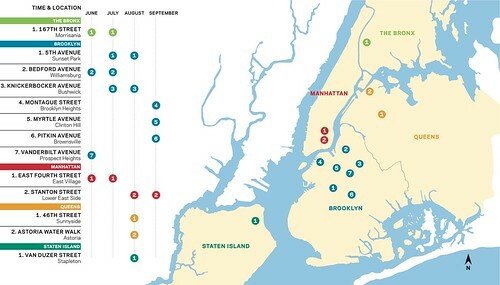 One of the most memorable events–and a sign of things to come–was last year’s Summer Streets program, which, for three Saturdays last August, closed off a large swath of Manhattan from the Brooklyn Bridge to 72nd Street, with most of the course running up Park Avenue. (There was also a less publicized closure of Bedford Avenue in Williamsburg.) Never one to stand (or bike) still, Sadik-Khan and the mayor announced today the expansion of the program throughout the summer and across all five boroughs this year. Details after the jump, but first two quick thoughts: Brooklyn, with seven sites, is the obvious winner; and why no Park Avenue this year? * Williamsburg Walks – Bedford Avenue between North 4th and North 9th Streets, Saturday June 6th, 13th, 20th, and 27th and July 4th and 11th, 12 p.m.- 9 p.m., Sponsored by Neighbors Allied for Good Growth, L Magazine. * Summer Streets on Vanderbilt – Vanderbilt Avenue between Dean Street and Park Place, Sundays in June, 12 p.m.- 5 p.m., Sponsored by Prospect Heights Neighborhood Development Coalition. * Summer Plazas, 5th Avenue – 5th Avenue between 48th and 52nd Streets, Sunday July 19th, 26th and August 2nd, 11 a.m.- 6 p.m., Sponsored by Sunset Park BID. * The Sunday Scene on Knickerbocker – Knickerbocker Avenue between Suydam and Starr Streets, Sunday July 19th, 26th and August 2nd, 11 a.m.- 5 p.m., Sponsored by Ridgewood Bushwick Senior Citizens Council. * Pitkin Saturday Plazas – Pitkin Avenue between Strauss and Thomas Boyland Streets, Saturday September 12th, 19th, and 26th, 11 a.m.- 5 p.m., Sponsored by Pitkin Avenue BID. * Move About Myrtle – Myrtle Avenue between Clinton Street and Emerson Place, Sunday September 6th, 13th, 20th, and 27th, 11 a.m.- 7 p.m., Sponsored by Myrtle Ave Partnership. * Montague Summer Space – Montague Street between Hicks and Clinton Streets, Sunday September 13th, 20th, and 27th, 10 a.m.- 6 p.m., Sponsored by Montague BID. * Meet the Street – East 4th Street between Bowery and 2nd Avenue, Saturdays in June, 3 p.m.-8 p.m., Sponsored by Fourth Arts Block. * Stanton Street Summer Sundays – Stanton Street between Allen and Orchard Streets, Sunday August 23rd and 30th and September 6th and 13th, 1 p.m.- 6:30 p.m., Sponsored by Lower East Side BID. * 46th Street Weekend Walks – 46th Street between Queens Boulevard and Greenpoint Avenue, Saturdays in August, 11 a.m.- 8 p.m., Sponsored by Sunnyside Shines BID. * Astoria Water Walk – Shore Boulevard between Astoria Park South and Ditmars Boulevard, Sunday August 9th, 16th, and 23rd, 11 a.m.- 4 p.m., Sponsored by Astoria Park Alliance.